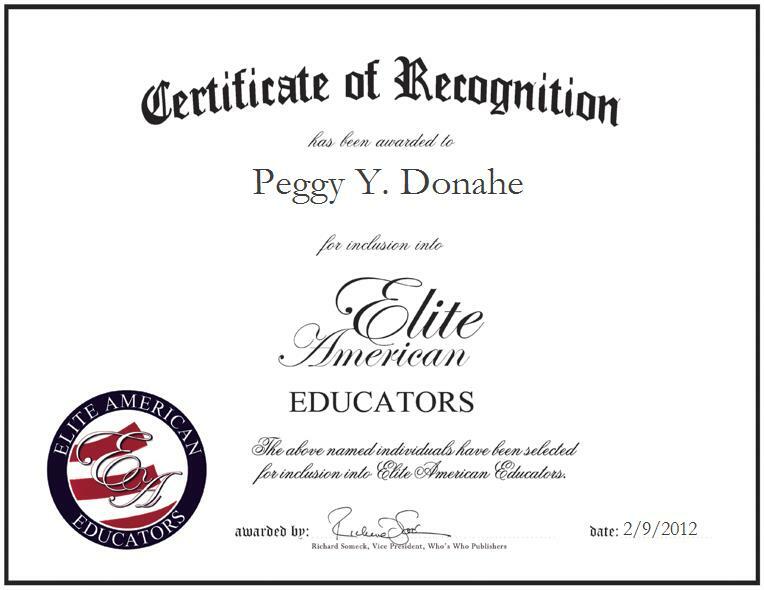 Peggy Y. Donahe, formerly a teacher with the Aneth Community School in Montezuma, North Dakota, recently reflected on the cherished moments she shared with students prior to her retirement in an interview with EliteAMERICAN Publishing. “Every day that I’d go into a classroom I enjoyed it; the students would always smile and say hello, and this was even when I wasn’t their classroom teacher anymore,” she said in an exclusive discussion with EliteAMERICAN. “Just being around the students was so enjoyable. I had taught 4th grade through 6th grade, these children were so eager to learn.” Before retiring from her role as a teacher, Ms. Donahe fulfilled a myriad of responsibilities; she served as a librarian, communicated with parents, organized book fairs, and worked with gifted children. Her dedication to her position prompted other teachers and members of her community to take notice—she is a five-time Who’s Who in Teachers nominee, and a three-time Employee of the Year award recipient. Ms. Donahe taught her first five years in education in Ashley, North Dakota, 19 years in Abercrombie, North Dakota, five years at Fort Yates and 15 years with the Aneth Community School, Utah, Shiprock Agency, N.M. Through it all, Ms. Donahe has remained passionate about helping students to achieve their goals and maintain stability in becoming future leaders. Despite obstacles, she prevailed by utilizing her talents as an educator with a love for teaching. “The challenge was definitely coming up with resources,” she said. “I had to buy a lot of these materials myself. I spent thousands of dollars to help these students and also bought some materials to develop my own ideas.” She maintained compassion and a genuine nurturing mentorship for her students, and was greatly involved in community and after-school programs that supported students in achieving growth. In addition to the many accomplishments that Ms. Donahe has recognized over the course of her teaching career, she was one of only 50 educators in the United States to be selected to be one of the NASA educators from 1997 to 2006. It was during the first three years as one of the 30 she learned about the “Stardust Comet Program” and all about the space station at Kennedy Air Force Base. Also, since Ms. Donahe taught at a Navajo reservation school she took courses over a period of two years to earn a certification of bilingual in the Navajo language. She was selected to attend a week-long NASA seminar for Native American educators on informing, learning, and teaching about the space program in classrooms. She has had works of poetry published in a National Poetry Society Book, themed to the tone of challenging oneself to overcome obstacles, and she has also served as a judge at poetry and debate contests. Additionally, Ms. Donahe has functioned as a speech teacher, and given those involved several tips for debating.